Sometimes, you don’t have to be a culinary genius to get the job done here at Fresh Veggies in the Desert. 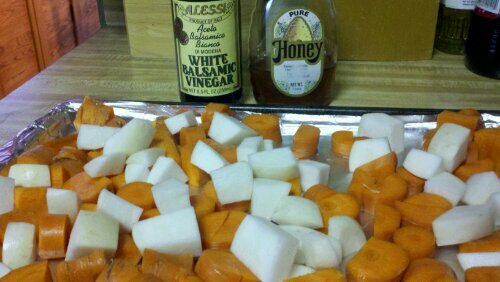 Just cut up some carrots and turnips (or other random root vegetables) and sprinkle with olive oil, balsamic vinegar and honey. Bake at 400 for about 45 minutes. 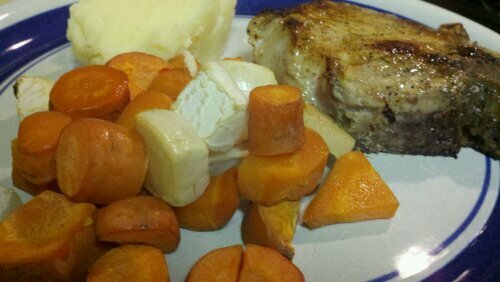 The rest of dinner looks pretty good, too. But, the carrots are awesome. Not awesome enough to make turnips my favorite but awesome enough to get me to eat a couple of them. The air is cold and there is a storm coming over the mountains. It is going to snow tonight. 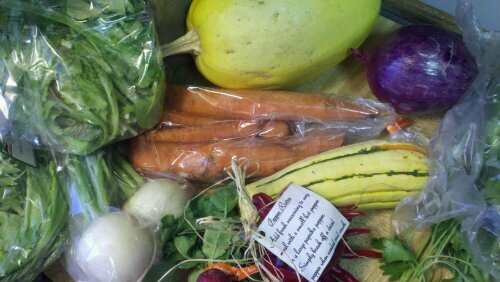 This makes me realize that there are only a few more weeks of the CSA boxes left to enjoy and I am a little sad. That is … until I see the goodies in this week’s box. What did I get? AND … a chile pepper ristra from Debbie Coblentz. 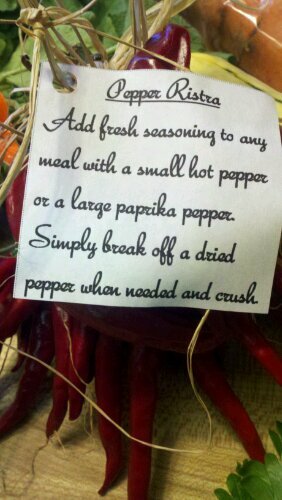 What’s a chile pepper ristra? According to the CSA newsletter, it is Mexican folklore that hanging a ristra on your door or in your home brings good luck. The ristra is a bunch of hot peppers attached together by a string that have been dried. The note on the peppers suggests putting a little bit in recipes throughout the year and to use them up by next spring. Maybe it’s just me, but this week’s box seems bigger. There are a couple of new additions but the portion sizes are a little bit larger. Yay! 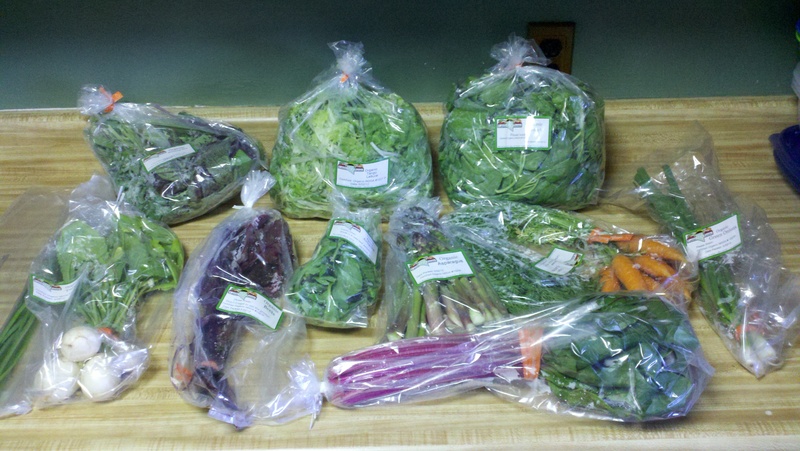 I have been pretty happy so far in my CSA experience. This just keeps getting better. I’m pretty excited to see those carrots. I might not share them this time. The full list is spinach, braising mix, lettuce, carrots, green onions, arugula, asparagus, beets, turnips, chard and garlic chives. Any good recipe suggestions? The weekly newsletter gave some nice tips for keeping the veggies fresh and preparing them. Good thing … I would hate to waste this green goodness. Add onion, garlic to spinach and cook just until spinach is slightly tender. Don’t overcook. At this time, you can puree half of the mixture if like a chunky soup or puree all of it. Melt butter in a pan. Whisk in flour until smooth. Add half and half and stir until smooth. Add cream mixture to spinach and heat just until warm. Do not boil. Stir constantly. Enjoy!